A new "sport" based around unravelling the mass of wires that can typically be found beneath computer desks the world over is taking off in the western US. The first "speedcabling" competition took place in an art gallery in Los Angeles and was won by LA-based web developer Matthew Howell. The challenge was devised by IT professional Steven Schkolne. 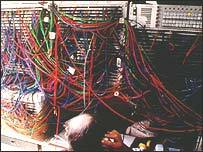 Contestants are faced with a tangled mass of six ethernet cables of various lengths. Their task is simply to separate them in the fastest time. To get them to replicate the conditions of the wires found snaking and choking their way around hard drive units, monitors and printers in offices worldwide, Schkolne first started by tangling them in a figure eight. Then he threw the bundles in a clothes dryer - no longer attached to any computer unit, naturally. "I did a bunch of experiments and found that putting them in a dryer for three minutes works pretty well, it allows them to tangle naturally," he told BBC World Service's Digital Planet programme. "After that, they're pretty much how they appear in nature." Two years ago, Mr Schkolne began to wonder if others shared both his skill and his passion for detangling cables. Asking around among friends and colleagues in Los Angeles, he found there was interest in a race to prove who was the king of the cables. "And this allows the judge to see it's been clearly separated. It also allows the winner to form a kind of victory posture - raising their arms above their head when they're done." Crucially, the cables also have to be able to carry a network signal after detangling. "The finals were brutal - 12 ethernet cords, some as long as 25 feet, all knotted into a nasty bundle," said eventual winner Mr Howell. Explaining his detangling technique, he said: "Each cable is its own rabbit hole. "So before going down one of those cable paths, up and around, weaving in and out, you have to pull it apart. "You have to pull the pieces out, and really call on the element of air." And to get that "air," Howell drew on some previous work experience - kneading pizza dough. "You kind of pull it, let it go, then you let it kind of spin in between your hands - and you don't really hold onto it for too long," he said. "Keep spinning and pulling, and it's really just kind of a 3D version of that pizza dough thing above your head, and then you see these little pieces flip out, and you pull them out." Howell dubs his technique "fierce data cloud." His prize for winning was a $50 gift certificate for dinner at a local Italian restaurant. A solution to the socket shortage?